Aging and chronic inflammatory syndromes, such as rheumatoid arthritis, are associated with high frequencies of CD4+CD28null T cells, which are rarely seen in healthy individuals younger than 40 years. Inasmuch as rheumatoid arthritis and aging are also associated with elevated levels of TNF-α, we examined whether this proinflammatory cytokine influences CD28 expression. Incubation of T cell lines and clones as well as Jurkat cells with TNF-α induced a reduction in the levels of cell surface expression of CD28. This effect of TNF-α was reversible; however, continuous culture of CD4+CD28+ T cell clones in TNF-α resulted in the appearance of a CD28null subset. In reporter gene bioassays, TNF-α was found to inhibit the activity of the CD28 minimal promoter. Inactivation of the promoter was accompanied by a marked reduction in DNA-protein complex formation by two DNA sequence motifs corresponding to the transcriptional initiator of the CD28 gene. Indeed, in vitro transcription assays showed that nuclear extracts from TNF-α-treated cells failed to activate transcription of DNA templates under the control of a consensus TATA box and the CD28 initiator sequences. In contrast, similar extracts from unstimulated T cells supported transcription. These results demonstrate that TNF-α directly influences CD28 gene transcription. We propose that the emergence of CD4+CD28null T cells in vivo is facilitated by increased production of TNF-α. The role of CD28 in T cell-mediated immunity is well documented (1). Its coengagement with the TCR is essential for the induction of IL-2 and its high affinity receptor CD25, signals from which are required to sustain T cell proliferation (2). Interaction of CD28 with its ligands, CD80 or CD86, also induces the synthesis of anti-apoptotic molecules, thereby protecting T cells from undergoing cell death (3). Targeted deletion of the CD28 gene in mice results in a severely immunocompromised phenotype, characterized by functionally impaired CD4+CD28null T cells and the inability to form germinal centers (4). Although CD28 is constitutively expressed on T cells, the levels of its expression on the cell surface are constantly modulated. In humans, CD28 is down-regulated following activation, and levels of expression decline progressively with replicative senescence (1, 5). CD28 down-regulation has also been reported during acute and chronic viral infections (6, 7). Interestingly, CD4+ T cells that completely lack expression of CD28 have been found in unusually high frequencies among patients with various inflammatory conditions such as rheumatoid arthritis (RA)4 (1, 8), Wegener’s granulomatosis (9), and unstable coronary artery disease (10). CD4+CD28null T cells also emerge during normal aging (11), with frequencies up to 50% of the total CD4 compartment found among some individuals older than 65 years. Recent studies demonstrate that such modulation and/or loss of CD28 expression on T cells are attributed to two regulatory sequences, sites α and β, in the gene promoter (5, 11). Changes in the levels of cell surface expression of CD28 are associated with the coordinate modulation of the protein-binding activities of sites α and β (5). Although the binding activities of α and β are independent of each other (11), they constitute a functionally singular transcriptional initiator (INR) element (12). Among CD28null T cells, this αβ-INR is inoperative because of the lack of α- and β-binding complexes. The central role of CD28 in the productive costimulation of T cell activation (13) suggests that modulation or loss of its expression could profoundly influence immune responses. Thus, we have been interested in examining situations that influence CD28 expression. Inasmuch as CD4+CD28null T cells have been first described from patients with RA (14) and that their high frequencies correlate with severe disease (8), we tested the hypothesis that proinflammatory cytokines, such as TNF-α, may regulate CD28 expression. Because TNF-α is considered to be the major humoral modulator of the pathogenic process in RA (15), it is reasonable that chronic elevated levels of TNF-α in vivo may directly impact T cell phenotype and function. Indeed, previous studies have demonstrated that TNF-α induces nondeletional and reversible T cell hyporesponsiveness in vitro and in vivo (16). Such T cell hyporesponsiveness is associated with the uncoupling of the proximal TCR signaling pathway (17). Although the impact of chronic exposure to TNF-α on the CD28 costimulatory pathway is not known, recent studies also show that TNF-α-induced T cell hyporesponsiveness may be in part due to the down-regulation of CD3ζ (18). Along these lines, it is important to note that although the nonapoptotic effects of TNF-α largely involve induction of genes (19, 20), there is increasing evidence for TNF-α-specific repression of gene expression (18, 21, 22, 23). In the present work, we directly examined whether TNF-α contributes to the loss of CD28 expression, and consequently, the emergence of CD4+CD28null T cells in a chronic inflammatory disease like RA. A similar argument might be made for the progressive increase in the frequencies of these unusual cells with normal aging (11), which is also associated with elevated TNF-α production (24, 25). The T cell lines Jurkat and 6TCEM20 (American Type Culture Collection (ATCC), Manassas, VA) were cultured in RPMI 1640 medium (BioWhittaker, Walkersville, MD) containing 10% FCS (Summit Biotechnology, Fort Collins, CO), 2 mM l-glutamine, 50 U/ml penicillin, 5 μg/ml streptomycin (Invitrogen Life Technologies, Carlsbad, CA). Cells were maintained at a density of 5 × 106 cells/ml in a humidified 5% CO2 tissue culture incubator. Human primary T cell lines and clones were established from fresh PBMC as described previously (5, 11, 26). Briefly, PBMC at 0.5–2 × 106 cells/ml were incubated on plate-immobilized anti-CD3 (OKT3; ATCC) for 3 days. CD4+ T cells were subsequently isolated by positive selection using the VarioMACS system (Miltenyi Biotec, Auburn, CA). Cells were passaged every 5–7 days in the RPMI 1640 medium described above supplemented with 20 U/ml recombinant human IL-2 (Proleukin; Chiron, Emeryville, CA) and feeder cells consisting of γ-irradiated neuraminidase-treated EBV-transformed B lymphoblastoid cells. Cells were maintained in a humidified 7.5% CO2 tissue culture incubator. T cell clones were established by limited dilution cloning of freshly isolated CD4+ T cells or from short-term cell lines (5, 11, 26). Clonality was determined by standard semi-nested RT-PCR for TCR β-chain V and J elements, size-fractionation, and sequencing. As with the primary cell lines, T cell clones were maintained on feeder cells of EBV-transformed B lymphoblastoid cells in the presence of 20 U/ml IL-2. For each experiment described, triplicate cultures of 1 × 106 T cells were added to 24-well plates. Human rTNF-α (R&D Systems, Minneapolis, MN) was added to appropriate wells and incubated for the indicated time periods. Based on initial experiments (data not shown), a concentration of 10 ng/ml TNF-α was found to be the optimal concentration that induces CD28 down-regulation. The relative amounts of CD28 transcripts before and after exposure to TNF-α were monitored by RT-PCR. Total RNA was isolated using TRIzol reagent (Invitrogen Life Technologies) treated with DNase I (Roche Molecular Biochemicals/Boehringer Mannheim, Indianapolis, IN), and first-strand cDNA was synthesized by standard techniques. PCR amplification of specific cDNA fragments was conducted using gene-specific primers (5). Parallel PCR experiments were also conducted for β-actin as a system control (5, 12). The expression of CD3, CD4, and CD28 on cell surfaces was examined by immunostaining and flow cytometry. Cells were incubated with PE-conjugated anti-CD28, FITC-conjugated anti-CD3, and PerCP-conjugated anti-CD4 (BD Biosciences, San Jose, CA) mAbs on ice for 15 min, washed, and fixed in 1% paraformaldehyde in PBS. A parallel sample of cells was also incubated with Ig isotypic controls (Simultest; BD Biosciences). All samples were immediately analyzed on a FACScan flow cytometer (BD Biosciences). Fluorescence data from at least 10,000 cells were collected from each sample and stored as list-modes. Off-line analyses of raw data were performed using WinMDI software (J. Trotter, Scripps Institute, La Jolla, CA). Flow cytometric quantification of the number of CD28 molecules on the cell surface was conducted using the QuantiBrite System (BD Biosciences). Briefly, cells were immunostained with PE-conjugated anti-CD28 Ab by standard protocols. Cytometric data for cells and four QuantiBrite-PE bead standards of known levels of PE fluorescence were acquired using QuantiQuest (BD Biosciences) on the same flow cytometer at identical instrument settings. The FL2 axis was converted into the number of PE molecules bound per cell, and was calibrated by the QuantiBrite beads. Slope and intercept information from the regression analyses was automatically saved with the acquired data files. The actual number of CD28 molecules per cell was estimated using QuantiCALC software (BD Biosciences). The rates of apoptosis in the cultures were determined by double staining of cells with annexin V and propidium iodide (PI) using a kit (Annexin V Fluos Staining kit; Roche Molecular Biochemicals/Boehringer Mannheim). Cells were immediately analyzed by flow cytometry. Apoptosis was determined as the percentage of annexin V+ cells that excluded PI. As system control, annexin V staining was also conducted with cells incubated with the apoptosis-inducing drug campothecin (27). 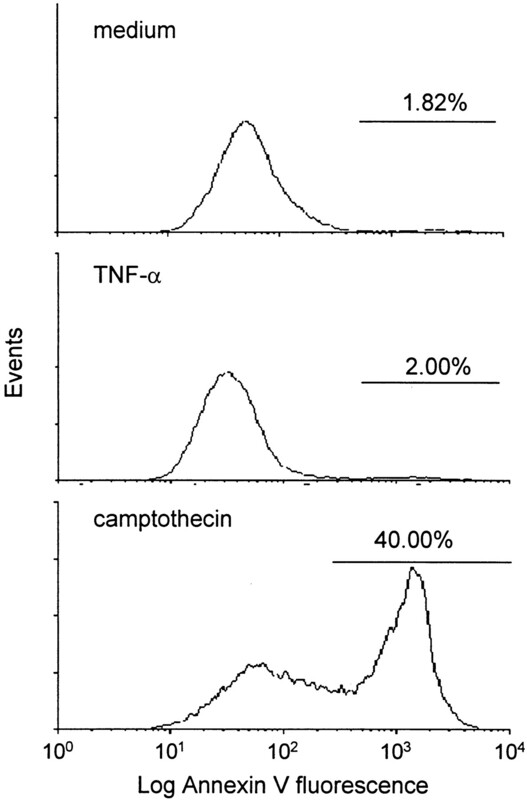 Cells were incubated with 4 μg/ml camptothecin (Acros-Fisher Scientific, Pittsburgh, PA) for 24 or 48 h and stained for annexin V, and the rate of apoptosis was compared with cells incubated with TNF-α. The proliferation rates of cultures were measured by two methods, namely, standard [3H]thymidine incorporation and staining with CFSE (Molecular Probes, Eugene, OR) (28). For thymidine incorporation assays, triplicate cultures of 1–5 × 104 T cells were added to 96-well plates. TNF-α was added at a final concentration of 10 ng/ml to the appropriate wells and cultured for 24 and 48 h. Approximately 1 μCi of [3H]thymidine (NEN, Boston, MA) was added to the cells during the last 4 h of incubation. Cells were harvested onto fiberglass filters (XtalScint; Beckman Instruments, Palo Alto, CA), and radioactivity was measured by scintillation spectrometry. For CFSE assays, triplicate cultures of 2 × 106 cells were stained with 10 μM CSFE for 10 min, washed, and cultured in the presence or absence of 10 ng/ml TNF-α. At the indicated time periods, cells were harvested and washed, and CSFE staining was analyzed by flow cytometry. The CD28 minimal promoter (11) was cloned into reporter plasmids containing the soluble alkaline phosphatase (SEAP) gene (BD CLONTECH Laboratories, Palo Alto, CA) and used to transform Escherichia coli DH5α (Invitrogen Life Technologies). Recombinant plasmids were prepared from randomly selected bacterial colonies and screened for the presence of the CD28 promoter sequences by restriction analysis and sequencing. Two bacterial clones were selected and subjected to two rounds of cesium chloride density centrifugation to isolate the plasmids. Transient transfection of Jurkat cells was conducted as described previously (11) with the following modifications. Approximately 1 × 107 cells were resuspended in 250 μl of drug-free medium and transferred to electroporation cuvettes (4-mm gap Cuvette Plus; BTX, San Diego, CA). CD28-SEAP reporter plasmid (28 μg) was added to the suspension to a final volume of 300 μl, gently mixed, and incubated for 10 min on ice. Samples were subjected to a single pulse of 300 V for 25 ms using a square wave electroporator (T820 Electro Square Porator; BTX Electroporation Systems) and then incubated on ice for 10 min. Cells were gently resuspended in 1 ml of drug-free culture medium and incubated at 37°C in a humidified atmosphere of 5% CO2 for 4 h. TNF-α was subsequently added to appropriate cultures and incubated for another 20 h. SEAP activity in the culture supernatant was measured by a specific colorimetric assay using the Great Escape SEAP detection kit (BD CLONTECH Laboratories). SEAP activity is heat stable unlike the endogenous alkaline phosphatase activity, which is heat labile. Enzyme activities were quantified using a luminometer (Lumat LB9501; Berthold Analytical, Nashua, NH). Similar transient transfection assays were conducted using SEAP reporters under the control of SV40 promoter and enhancer sequences (BD CLONTECH Laboratories), which served as positive system controls. As negative controls, promoterless SEAP plasmids were used. To normalize for transfection efficiency, each sample was cotransfected with 2 μg of CMV-luciferase reporter plasmid (29). Luciferase activities of samples were detected from the cell pellets by chemiluminescence using a kit (Promega, Madison, WI) and quantified using a luminometer. The quotient of luciferase activities between TNF-α-treated cells and unstimulated controls was determined. This quantity was then used as a divisor for the corresponding SEAP activity. Nuclear extracts were prepared as described previously (5, 11, 29). Briefly, cells were lysed in HEPES hypotonic buffer, and the nuclei were isolated by centrifugation. Nuclear proteins were extracted in a high-salt buffer, and protein concentration was determined using a protein assay kit (Bio-Rad, Richmond, CA). EMSA was conducted as described previously (5, 11). Briefly, 10 μg of nuclear extract were combined with 3 μg of poly(dI-dC) (ICN Biomedicals, Costa Mesa, CA) and 3 μg of a nonspecific oligonucleotide (5′-TCGAAGTACTCAATTGCTCGAGATCGATAGATCTGAATTCAGTACTCC-3′) (29) in a binding buffer to a total reaction volume of 50 μl. Reactions were incubated on ice for 30 min, after which radiolabeled probes were added and incubated for another 30 min at room temperature. Protein-DNA complexes were resolved using 6% nondenaturing polyacrylamide gels and autoradiography. Binding probes consisted of oligonucleotides corresponding to sites α and β sequences of the CD28 minimal promoter (11). Sites α (5′-CGTTATATCCTGTGTGAAAGCTGCA-3′) and β (5′-TGTGGTTTGAGTGCCTTGAT-3′) sequences and their respective complimentary strands were synthesized, end-labeled with [32P]γ-ATP (NEN), and annealed by standard procedures. As system controls, similar probes corresponding to SP1 (5′-GCTCCAGGCGGGGGCGGGGCCCGGGTTCGG-3′) (29) were synthesized and used in parallel EMSAs. Probes were stored at −20°C and used within 7 days. All oligonucleotide probes were synthesized at the Mayo Molecular Biology Core Facility and purified by column chromatography as described previously (30). Two nonoverlapping sequences, sites α and β, constitute the CD28 INR element (12). This contiguous αβ sequence (5′-CGTTATATCCTGTGTGAAAGCTGCAGTCAGGATGCCTTGTGGTTTGAGTGCCTTGAT-3′; the underlined 5′ and 3′ sequences correspond to α and β, respectively) (11) was cloned into transcription plasmid templates provided by Dr. J. Kaufmann (Chiron) (12). These plasmids contained a consensus TATA box, the INR of TdT, and a 180-bp G-less cassette (31, 32). The contiguous αβ sequences were introduced into these plasmids replacing the TdT-INR by the gene-splicing-by-overlap-extension technique (30). Constructs were amplified in E. coli DH5α (Invitrogen Life Technologies) by standard transformation procedures. Randomly selected bacterial colonies were screened for the presence of αβ-INR sequences by direct PCR. DNA sequencing of plasmids authenticated the correct introduction of αβ-INR. Plasmids were prepared using a purification kit (EndoFree; Qiagen, Chatsworth, CA). Conditions of transcription were as described previously (12). Briefly, dialyzed nuclear extracts were incubated with 300 ng of plasmid template at 30°C for 60 min. A mixture of nucleotides (100 mM ATP, 100 mM CTP, d-CD3-GTP, 50 μM [32P]α-UTP (Amersham Pharmacia Biotech, Piscataway, NJ)) was added, and the total reaction volume was adjusted to 100 μl and incubated for 90 min at 30°C. Products were digested with 60 IU RNase T1 (Roche Molecular Biochemicals/Boehringer Mannheim), extracted with phenol-chloroform, and ethanol precipitated. Samples were subjected to urea-polyacrylamide gel electrophoresis and autoradiography. Because aging and RA are associated with elevated levels of TNF-α (15, 24, 25) that coincides with the emergence of CD4+CD28null T cells (8, 11), we examined whether there is a causal relationship between these two phenomena. T cells were incubated in TNF-α and the levels of CD28 expression were examined. Depicted in Fig. 1⇓ is a representative flow cytometric analysis of the immunostaining of CD28 on a CD4+CD28+ T cell line. After 24 h of incubation with 10 ng/ml TNF-α, there was at least a half-magnitude reduction of the cell surface expression of CD28. Such a decrease in CD28 expression was specific because the level of CD4 expression was unaffected by TNF-α. Similar results were seen with several T cell lines and clones and transformed T cells such as Jurkat and 6TCEM20 (data not shown). In all assays conducted, incubation of T cells with TNF-α consistently resulted in significant decreases in the cell surface levels of CD28 expression without affecting the expression levels of other T cell Ags including CD4 and CD3. TNF-α down-regulates cell surface expression of CD28 on T cells. CD4+CD28+ T cell clones and lines were incubated in 10 ng/ml rTNF-α for 24 h. Cells were washed, immunostained for CD3, CD4, and CD28, and analyzed by flow cytometry. Specificity of immunostaining for each of the Ags was ascertained by the background fluorescence of cells incubated with Ig isotype controls. Histograms shown are representative of at least three experiments for each of four immortalized T cell lines and five T cell lines and clones examined. These observations raised the question of whether continuous exposure of T cells to TNF-α leads to a CD28null phenotype. CD4+CD28+ T cell clones were isolated and maintained in standard culture conditions with or without TNF-α. As shown in Fig. 2⇓, maintenance of T cells with exogenous TNF-α resulted in the emergence of a subset of CD28null cells within 8 wk of culture. This subset comprised ≥30% of the culture at the time of analysis. 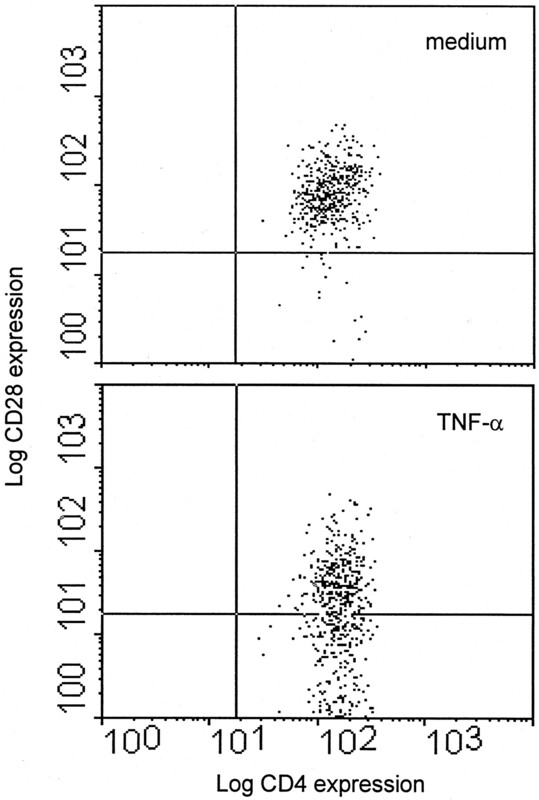 The levels of CD4 and CD3 were unaffected by prolonged exposure of the cells in TNF-α (data not shown). Prolonged exposure of CD28+T cells to TNF-α results in the emergence of CD28null cells. CD4+CD28+ T cell clones were maintained in 20 U/ml IL-2 and weekly stimulation with irradiated EBV-transformed B cells as feeders. TNF-α (10 ng/ml) was added to appropriate cultures and replenished every 3 days. Levels of CD4 and CD28 expression were examined periodically by immunostaining and flow cytometry. Data shown are levels of CD4 and CD28 expression after 8 wk of culture. Because of the consistent responses of all types of T cells examined, Jurkat cells were subsequently used as a model to further elucidate the mechanism(s) of TNF-α-induced down-regulation of CD28. Fig. 3⇓ demonstrates that incubation of Jurkat cells with TNF-α elicited a significant decrease in the actual number of CD28 molecules on the cell surface. Such decreases were elicited in a dose- and time-dependent fashion. Interestingly, these TNF-α-induced decreases in the number of CD28 molecules were reversible as indicated by the restoration of baseline levels of expression when TNF-α was removed from the cultures. Moreover, these TNF-α-induced changes in the number of CD28 molecules correlated with equivalent changes in the relative amounts of specific transcripts. TNF-α-induced down-regulation of CD28 is reversible, and occurs at the mRNA level. A, Reversibility of TNF-α-induced down-regulation of CD28. Jurkat T cells were cultured in the presence of 10 or 50 ng/ml TNF-α for 24 and 48 h as in Fig. 1⇑. At the latter time period, parallel triplicate cultures were harvested, washed, and cultured for an additional 24 h in the absence of TNF-α. CD28 expression was examined by quantitative flow cytometry by QuantiBrite calibration and estimated by QuantiCALC software. Data shown are the total number of CD28 molecules per cell in three independent experiments. B, Down-regulation of CD28 transcripts. Jurkat cells were incubated with 10 ng/ml TNF-α for 48 h (TNF) or were harvested, washed, and subsequently incubated for an additional 24 h with additional stimulation (washed). Total RNA was prepared and subjected to RT-PCR analysis for CD28 transcripts. Inasmuch as TNF-α has the capacity to induce cell death, regardless of the receptor with which it interacts (33, 34), we also examined whether apoptosis might be a confounding factor in the observed TNF-α-induced down-regulation of CD28. For these studies, we determined the levels of annexin V staining, which measures the rate of apoptosis before and after exposure of cells to TNF-α. As shown in Fig. 4⇓, there was no significant difference in the level of annexin V staining between the unstimulated controls and cells exposed to TNF-α. At the two concentrations of TNF-α used in these studies (10 and 50 ng/ml), there were no apparent changes in annexin V staining of cells. As expected, exposure of cells to the apoptosis-inducing drug camptothecin (27) induced a significant number of cells to undergo apoptosis. TNF-α does not induce apoptosis of Jurkat T cells. Jurkat T cells were incubated in the presence (TNF) or absence (medium) of 10 ng/ml TNF-α for 48 h. Cells were washed, immunostained for annexin V, and analyzed by flow cytometry. To electronically gate out cellular debris, PI was added to the cell suspension during analysis. Apoptosis was measured as the percentage of annexin V-positive cells among PI-negative cells. As a system control, similar analysis was conducted with cells incubated with the apoptosis-inducing drug camptothecin. TNF-α is also known to have a growth-promoting effect (35). Thus, we examined whether the addition of exogenous TNF-α affected cell growth patterns. Cells were labeled with CSFE and incubated with TNF-α, and the rate of decay of CSFE fluorescence, as a consequence of cell division, was followed. As shown in Fig. 5⇓, the levels of CSFE staining were virtually identical between the unstimulated controls and the cells incubated with TNF-α. Despite the fact that cells used in these studies were unsynchronized, TNF-α did not appear to affect the rate of cell division during a 5-day culture period. Similar results were obtained in proliferation assays using [3H]thymidine incorporation (data not shown). Triplicate cultures of cells incubated with or without TNF-α showed no significant differences in proliferation after 3 days of culture. Clearly, neither increased apoptotic cell death nor changes in cell turnover kinetics was related to the observed diminution of CD28 expression on T cells after TNF-α exposure. TNF-α does not change the rate of proliferation of Jurkat T cells. Jurkat T cells were labeled with CFSE and cultured in the presence or absence of 10 ng/ml TNF-α. 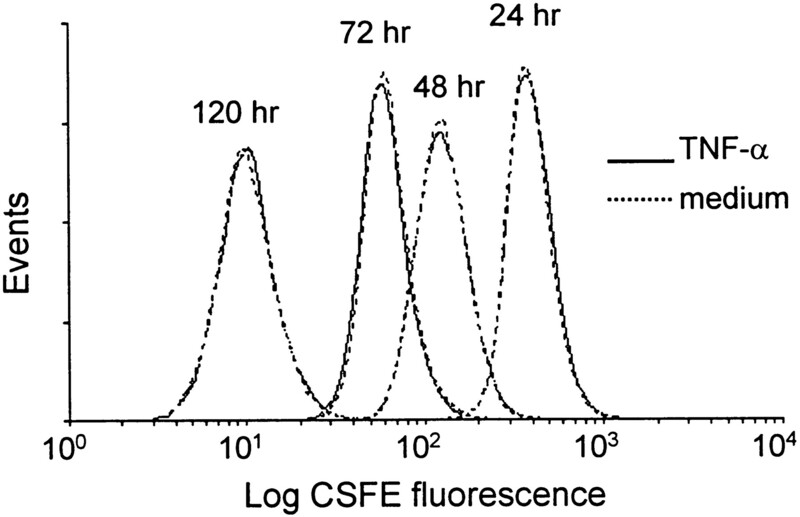 At the indicated time periods, cells were harvested and analyzed for the amount of residual cell-incorporated CFSE fluorescence by flow cytometry. The observation that TNF-α specifically induces a significant reduction in the amount of CD28 mRNA (Fig. 3⇑) suggested that TNF-α directly affected transcription. Therefore, we examined whether TNF-α influences the activity of the CD28 promoter. In previous studies (11), we described the minimal promoter consisting of the 5′ proximal 400-bp sequence flanking the translation initiation codon (36). Truncation and mutational studies showed that this 400-bp sequence contained the minimal regulatory elements required for CD28 gene transcription. Such regulatory elements, subsequently identified as sites α and β, were found to control the basal expression of CD28, and were responsive to down-regulation by activation through the TCR or by pharmacologic agents such as phorbol esters (5, 11, 12). Therefore, we examined whether the TNF-α-induced down-regulation of CD28 transcription (Fig. 3⇑) might also be attributed to the repression of the 400-bp minimal promoter sequence. This sequence was used in reporter gene bioassays. As shown in Fig. 6⇓, transfection of reporter plasmids containing the CD28 minimal promoter into CD28+ Jurkat cells resulted in high levels of expression of the reporter gene. Incubation of transfectants with TNF-α showed pronounced repression of reporter gene activities of two independent reporter clones examined. In contrast, bioassays using reporter plasmids containing SV40 promoter and enhancer sequences showed high levels of reporter gene activity that were unaffected by incubation of transfectants in TNF-α. As expected, bioassays using vector controls did not yield significant reporter gene activities. TNF-α represses the CD28 minimal promoter. The CD28 minimal promoter (CD28 min) (11 ) was cloned into the SEAP reporter plasmid, and used in transient transfection assays. Twenty-eight micrograms of this SEAP reporter was cotransfected with 1 μg of CMV-luciferase reporter into Jurkat T cells. TNF-α (10 μg/ml) was added 4 h after transfection, and cells were cultured for another 24 h. Similar transfections were conducted with SEAP reporters containing SV40 promoter and enhancer sequences (SV40 pro/enh) and those lacking promoter sequences (control vector). SEAP reporter activity was determined as the amount of heat-stable alkaline phosphatase activity of culture supernatants normalized against luciferase activity of the cell pellets. 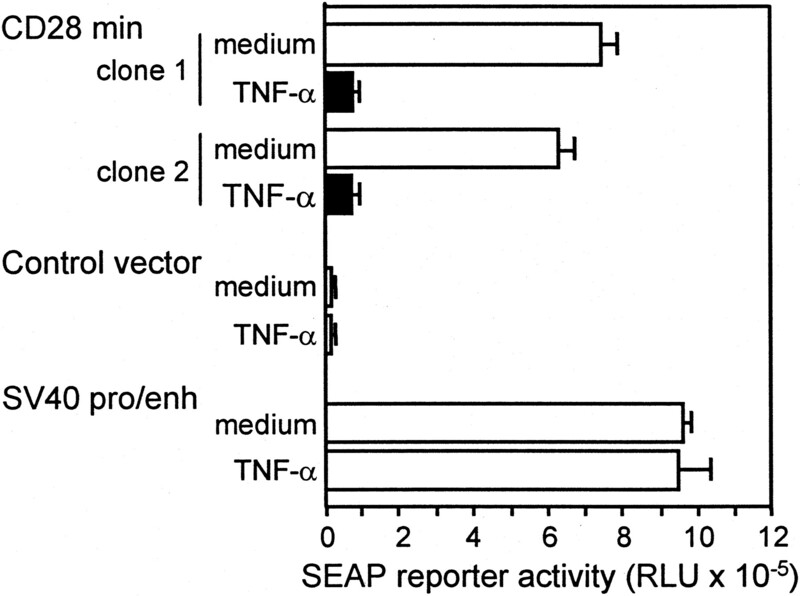 Data shown are SEAP activities in triplicate transfections for each of the indicated reporter plasmids. In previous studies, we demonstrated that two sequence motifs, sites α and β, regulate the activity of the CD28 minimal promoter (11). Structural analyses showed that these tandem sequences are unique to the CD28 gene and do not resemble other known regulatory elements (12). In EMSAs, these two sequences exhibited nonoverlapping and noncompeting DNA-protein complexes, formation of which was unaffected by mutated variants or by structurally divergent sequences in competitive EMSAs (11). The formation of such motif-specific DNA-protein complexes were found only in CD28+ cells, and were subject to modulation by TCR-derived signals or by pharmacologic agents (5). Therefore, similar experiments were conducted to examine whether the observed repression of the CD28 minimal promoter after TNF-α exposure (Fig. 6⇑) might be due to the loss of α-/β-bound complexes. As shown in Fig. 7⇓, DNA-protein complex formation by these two sequences coordinately and progressively decreased with incubation of cells in TNF-α. After 48 h of incubation, binding activities of both sequences were barely detectable. However, the subsequent removal of TNF-α from the cell cultures restored the motif-binding activities. TNF-α induces the loss of CD28 sites α- and β-binding activities. Jurkat T cells were incubated in 10 ng/ml TNF-α for 24 and 48 h. At the latter time period, cells were washed and incubated for an additional 24 h without further stimulation. Nuclear extracts were prepared for each indicated time period and used in EMSAs with dsDNA-binding probes corresponding to the sites α and β of the CD28 INR (11 ,12 ). The motif-specific binding activities are indicated by arrows. As a system control, similar EMSAs were conducted using the SP1 probe (29 ). Radiograms shown are representative of at least three experiments using different batches of nuclear extracts. The inhibition of DNA-binding activities did not appear to be a generalized phenomenon. Similar assays using oligonucleotide probes corresponding to SP1 revealed the insensitivity of the SP1-binding proteins to TNF-α. Although sites α and β have nonoverlapping and noncompeting protein-binding activities (5, 11), they function as a singular INR element (12). Thus, we examined whether TNF-α-induced decreases in the levels of α- and β-binding activities correlated with the loss of transcriptional activity. For these studies, in vitro transcription assays on INR-driven DNA templates were conducted using nuclear extracts from cells treated with TNF-α or unstimulated controls. Such templates contained either the CD28 αβ-INR (12) or the TdT-INR (31, 32). As shown in Fig. 8⇓, the transcriptional activities of templates controlled by the CD28 αβ-INR and the TdT-INR were comparable in assays using nuclear extracts from unstimulated cells. As expected, the mutated variant of the TDT-INR consistently yielded low levels of activity. However, in assays using extracts from TNF-α-treated cells, the CD28 αβ-INR activities significantly decreased. Such reductions in specific INR activities correlated with the incubation time in TNF-α but were restored to high levels when TNF-α was subsequently washed away from the cultures. In contrast, the levels of transcriptional activities of wild-type and mutant forms of INR-TdT were unaffected by TNF-α. TNF-α represses the transcriptional activity of the CD28 αβ composite INR. Sites α and β constitute a composite INR (12 ). These sequences were cloned as a contiguous unit downstream from a consensus TATA box and immediately flanking a G-less cassette. This construct was used as a DNA template for in vitro transcription experiments using nuclear extracts from Jurkat T cells incubated in 10 ng/ml TNF-α at the indicated time periods. As system control, similar experiments were conducted using templates containing the INR element of TdT or its mutated variant (31 ,32 ). Data shown are the relative amounts of cassette RNA transcripts produced from two separate transcription reactions for each of the nuclear extracts prepared. Data presented here unequivocally demonstrate that TNF-α down-regulates the level of cell surface expression of CD28 on T cells. The modulatory effect of TNF-α on CD28 is at the level of transcription (Fig. 3⇑). Exposure of T cells to TNF-α leads to the repression of the transcriptional activity of the gene promoter (Fig. 6⇑) by inhibiting the binding of nuclear protein complexes (Fig. 7⇑) that specifically recognize two basal regulatory sequences, sites α and β (5, 11). In recent work, we reported that these sequences constitute a functionally singular INR element, which is responsible for the initiation of transcription of the CD28 gene (12). Indeed, the present data show the inability of nuclear extracts from T cells treated with TNF-α to initiate transcription of DNA templates under the control of the αβ-INR (Fig. 8⇑). Although the composition of DNA-protein complexes recognizing αβ-INR is currently being examined, the present data are the first indication that TNF-α can have a strong repressive effect at the level of transcriptional initiation. This is in marked contrast with studies showing the repressive effects of TNF-α principally through the inactivation of auxiliary transcription factors and/or enhancers. A typical example is the TNF-α-induced inhibition of type II collagen synthesis (22, 37) that involves the inactivation of Sox9, a member of the high mobility group of transcription factors (38) that are generally not associated with the basal transcription complex. Another example is the repression of IL-12 production that occurs through the inactivation of a yet unidentified enhancer protein that may interact with NF-κB (21). The specific inhibition of the CD28 αβ-INR element by TNF-α leading to the down-regulation and eventual loss of the CD28 Ag on the T cell surface (Fig. 2⇑) further supports the hypothesis that the loss or gain of INR function is an important determinant of cell phenotype (12). Although INRs are core promoter elements (39, 40), they can direct the cell-specific expression of genes such as the lymphocyte-restricted expression of TdT (41) and the TCR Vβ chain (42). This is because INR sequences may define binding sites for gene-specific transcription factors (43, 44, 45, 46) in lieu of the components of the basal transcriptional initiation complex (47, 48, 49). In the present work, there is an apparent specificity of TNF-α in inactivating the CD28 αβ-INR. Other INR-regulated genes, such as CD4 (50, 51), are unaffected by TNF-α (Fig. 1⇑). This may be attributed to the fact that the CD28 αβ-INR has no homology to the consensus INR sequence (12, 52) as the CD4 INR does. Inasmuch as DNA binding of transcription factors is largely motif specific, sequence diversity is an important factor that influences INR-dependent regulation of genes. We suspect that the protein complexes bound by the CD28 αβ-INR are different from those that recognize CD4 INR, hence their differential susceptibility to inactivation by TNF-α. Although TNF-α exerts a strong inhibitory effect on the transcription of the CD28 gene, it is unclear why there appears to be a more gradual decrease in the levels of the cell surface expression of the CD28 Ag. Neither a 48-h (Figs. 1⇑ and 3⇑) nor a 7-day exposure (data not shown) of cells to TNF-α results in the complete loss of CD28 on the cell surface. One possible explanation is that the CD28 molecule has a long half-life. It is also possible that preformed or previously internalized CD28 Ags are being recycled to the cell surface to compensate for the lack of de novo synthesis due to the inhibition of transcription. Such recycling of CD28 has been previously reported in murine mast cells (53). A more likely possibility is that T cells become refractory to TNF-α because it down-regulates its own receptors. Previous studies have shown that TNF-α induces a rapid internalization of the p55 receptor and the shedding of the p75 receptor (54). It is thought that receptor shedding is a means to prevent harmful effects of cytokine pleiotropy (55) such as apoptosis, which can be one of the ill effects of TNF-α on T cells (33, 34). However, in the present work TNF-α, at the concentrations used, did not elicit cell death (Fig. 4⇑) nor did it affect the rate of T cell proliferation (Fig. 5⇑). Interestingly, our results show that CD28null T cells can emerge from CD28+ precursors that are continuously exposed to TNF-α (Fig. 2⇑). Because of TNF receptor shedding and internalization, these data indicate that only by sustained exposure of primary CD4+ T cells to a TNF-α-rich environment can a CD28null subset emerge. Presumably, a cycle of synthesis and depletion of TNF-α may not be sufficient enough to completely inhibit CD28 transcription. This suggestion is supported by observations that withdrawal of TNF-α from T cell cultures restores the level of CD28 expression on the cell surface (Fig. 3⇑) as well as transcriptional activity of the gene promoter (Figs. 7⇑ and 8⇑). 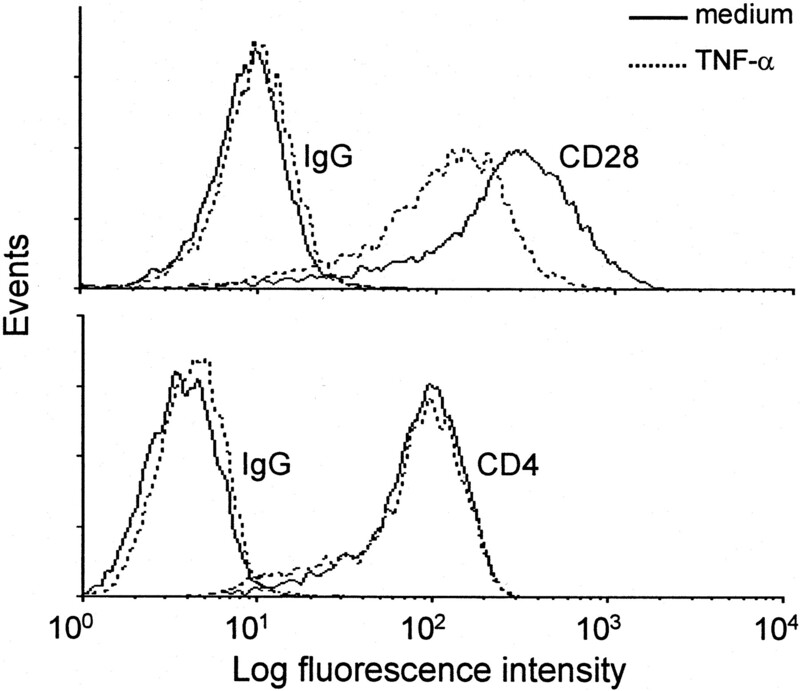 Whether CD28null T cells derived from CD28+ T cells chronically exposed to TNF-α (Fig. 2⇑) can re-express CD28 remains to be examined. CD28null T cells generated in vitro with TNF-α are refractory to stimulation through the TCR, hence they are not amenable to propagation (data not shown). This is consistent with studies reporting that prolonged in vitro exposure of T cells to TNF-α also leads to the inhibition of CD3ζ phosphorylation (18). This inhibitory effect of TNF-α is only partially reversed by the removal of TNF-α from cultures, suggesting that functional restoration of in vitro-generated CD28null T cells may depend on a culture system that completely alleviates the repressive effects of prolonged TNF-α exposure. Interestingly, we recently found that some, but not all, in vivo-derived CD28null T cell clones may re-express CD28 under certain culture conditions (J. J. Goronzy, C. M. Weyand, and K. J. Warrington, manuscript in preparation). Although a CD28null phenotype is largely stable (8, 11, 12, 14), we have preliminary data indicating that the formation of protein complexes that bind the CD28-INR and are the specific targets of inhibition by TNF-α (Figs. 7⇑ and 8⇑), can be restored in certain cases, suggesting that CD28 expression might be reversibly modulated in vivo. The emergence of CD4+CD28null T cells in vivo among patients with inflammatory diseases such as RA (8) and during normal aging (11) seems to be more than coincidental with elevated levels of TNF-α (15, 24, 25). Our data strongly indicate that among the consequences of chronic exposure of T cells to TNF-α is the repression of CD28 transcription that may lead to CD28null phenotype. On the one hand, it may be of interest to examine whether the reported efficacy of anti-TNF-α therapies in RA (56, 57, 58) involves a resurgence of T cell populations that re-express CD28. On the other hand, the emergence of CD4+CD28null T cells among healthy individuals such as those found among the elderly might also involve other mechanisms independent of TNF-α. Although our data provide definitive proof that CD28null T cells may emerge from CD28+ cells, the possibility that in vivo these two cells may also come from separate lineages remains to be examined. We thank Dr. Jörg Kaufmann (Chiron) for the TdT-INR constructs; Jacek Witkowski, Kay Spickschen, and Melchor Alvarez-de Mon for technical assistance; and James W. Fulbright and Tammy Dahl for assistance in the preparation of the manuscript. ↵1 This work was supported by the Mayo Foundation, the Fogarty International Center, and grants from the National Institutes of Health (R01 AG15043, R01 AR41974, and R03 AR45830). ↵2 E.B. and A.N.V. contributed equally to this work and are regarded as co-first authors. ↵4 Abbreviations used in this paper: RA, rheumatoid arthritis; INR, initiator; PI, propidium iodide; SEAP, soluble alkaline phosphatase.